Condition: Heavy wear and tear. The lens was clean and in working order, but close to being retired. My other rental with LensProToGo.com was the exact opposite as it was a brand new lens, so the morale of the story here is don’t judge a company by the age of a lens. See the paragraph below for more details on this issue. 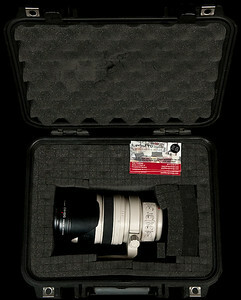 Accessories Included: Lens hood and cap stored in a Pelican 1400 case. No lens UV filter or lens plate included, but both available upon request. As you might expect, fraud is a problem in the lens rental industry as someone with stolen identity and a stolen credit card can rent a lens and then never return it. When dealing with first time customers, it is natural for the risk level to be high which is why Paul had asked me to call in. When I refused, he still put the customer first (assuming I was legit rather than avoiding to send the lens altogether – a risk on his part), but he managed his risk by sending his oldest copy of the 28-300mm. He has two new copies he could have sent me, but my refusal to talk to him meant he had to prepare for a loss so sending an old lens was his way of doing that. I totally understand this as I would do the same thing if I were in his shoes. I would encourage new customers to call in between the hours of 8:30 AM to 6:30 PM EASTERN to make sure that the risk level is reduced so you don’t end up with an old lens. Do you drop ship rentals to hotels, kinkos, ups store, etc...? Do you rent anything besides just lenses? Yes, cameras, flashes, tripods, monopods, pocket wizards, light meters, underwater housings, gyros. Lens damage in transit is naturally a big concern for renters, so how do you pack your gear? 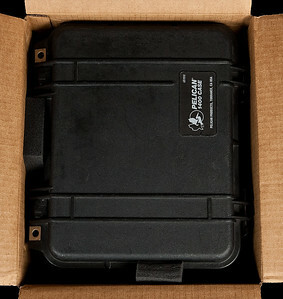 We ship our gear in Pelican cases. Damage in transit has never happened. Some companies have one copy of each product, so that once it is rented you are out of luck. Others have multiple copies of each item. While I imagine this would vary from product to product (i.e., perhaps only one 400 f/2.8, but a dozen 50mm f/1.4), what would you like readers to know about your selection and availability? We have a huge selection of lenses. For some we have dozens and dozens of copies. As our demand continues to grow, we’ll keep buying more! What type of accessories do you include with the rental? Do you include any filters (i.e., UV filters)? Cases? 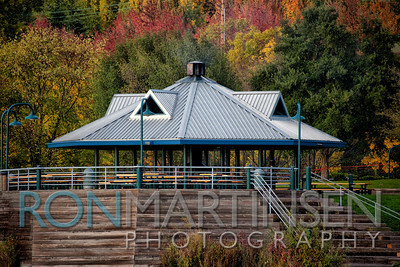 Do you include lens plates on lenses with tripod collars? Do you include hoods, even on lenses that don’t come with hoods from the manufacturer (i.e., Canon L has hoods, but EF-S lenses don’t)? We include a UV filter free of charge if one is requested. We also include Wimberley type plates free of charge on request. Most lenses do come with a hood and tripod collar as well. The rental insurance will cover repair or replacement of a lens if it is damaged. You will then be responsible for paying the deductible which is 10% of the replacement value. If you do not purchase the optional rental insurance, you will be responsible for the cost of repairing or replacing the damaged lens. Example: You rent a lens that has a value of $1,000 and do NOT purchase the rental insurance. 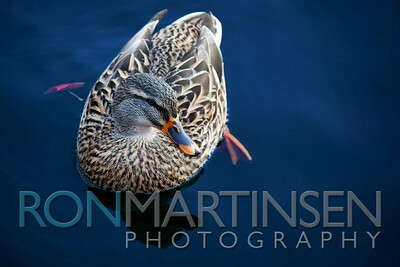 You then damage the lens while you are renting it and the lens requires repairs totaling $300. You are responsible for the entire $300. Example: You rent a lens that has a value of $1,000 and DO purchase the rental insurance. You then damage the lens while you are renting it and the lens requires repairs totaling $300. You are responsible for paying the deductible of $100 ($1,000 x 10%). How does your policy differ for lens damage from minor cosmetic (i.e., a scuff, a scratch, etc…) to major (i.e., broken button, dropped on concrete major damage, broken IS/VR, etc…)? 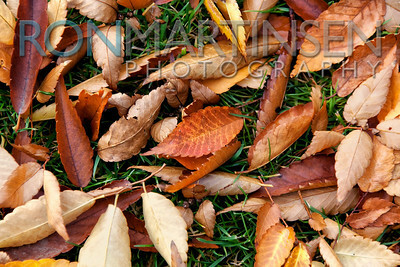 Cosmetic damage is just normal wear and tear. We always want to be proud of the gear we send out. Do you take advanced rental appointments? (i.e., someone going to Antarctica or a Safari would want to reserve a rental months in advance to ensure they would have the unit they needed when they left for their trip). If so, what is your advance rental policy, including cancellation policy? We strongly encourage reservations and accept them up to four months in advance. 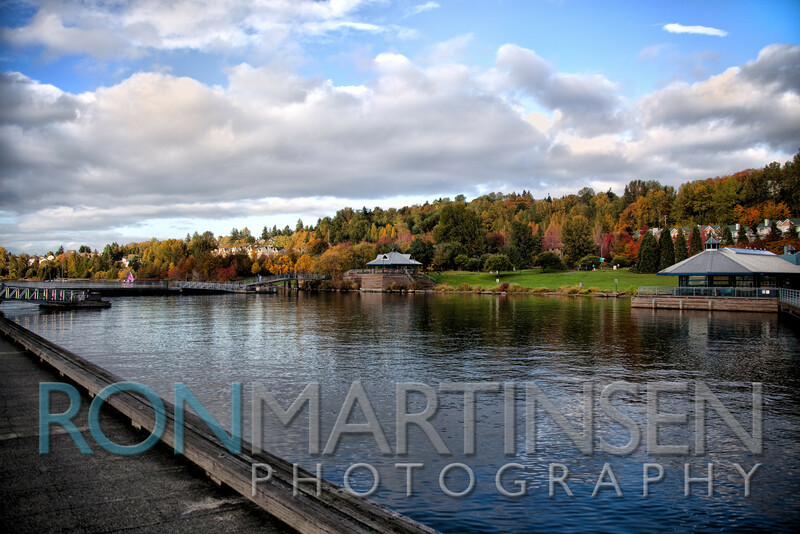 A $50 cancellation fee is applicable to camera bodies and super telephoto lenses. If someone is renting a lens and needs more time (i.e., missed a flight, extended trip, etc…), can they call or email to extend the rental at the normal daily rate? What are your late return policy and fees? Yes, nearly 40% of all of our customers rent for longer than the original rental period. Just call or email us. If you are late with a lens, we charge the appropriate pro rated rate. 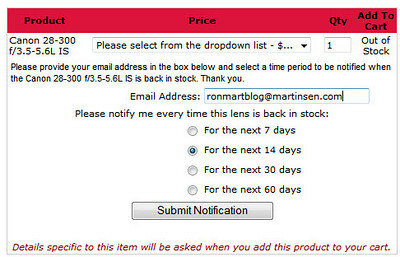 If a desired lens is unavailable, can someone get on a waiting list via your web site and be alerted when it is going to be available? Can the see at a glance on the web site when the unit is due back? Yes and yes. We do have an automated email notification system. However, if a lens or camera is not in stock, we strongly encourage customer to pick up the phone and call us so they can reserve one. Does your site offer any lens review or comparison features? Yes, we have reviews as well as links to other reviews. What is your process for communicating with the customer from the time an order is placed until the time the rental is returned and the transaction completed? We are extremely thorough with customer communication. 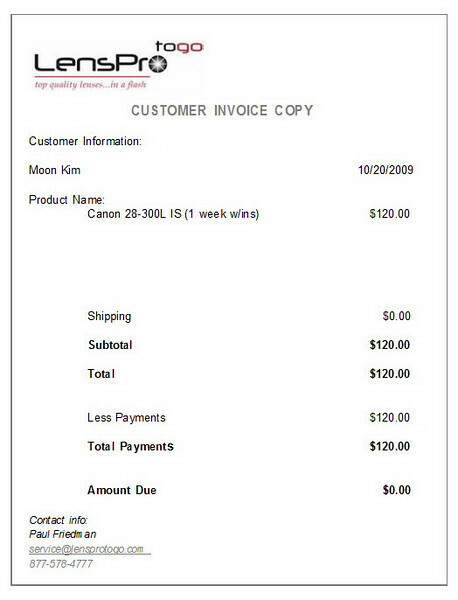 When an order is placed online, the customer immediately receives an email receipt. When the order is shipped, the customer receives an email with the tracking number from UPS. He or she also receives a thank you note via email with some details about the rental. One day before the customer is due to send the gear back, he or she will receive an email from us thanking them for the rental, reminding them that the gear is due to be sent back tomorrow and an offer to extend the rental for another week for $x. If a customer is frequently renting the same lens, do you offer any special program for them to “rent this lens again” or any “frequent user discount”? We do offer a discount to our most frequent customers. How fast can you get a lens to a customer that needs one in a hurry (i.e., photographer has a lens failure and needs a replacement ASAP)? Canon and Nikon are the big players, but do you rent lenses or equipment from other brands? No, but if the market share for any of the 3rd tier players rises, we will consider adding them into our inventory. What’s the largest lenses you rent (i.e., 600mm, etc…)? What’s the most common lenses you rent? What brands do you carry? 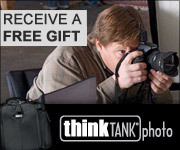 We carry Canon and Nikon. The longest Canon lens is the Canon 800 f/5.6L IS and the longest Nikon is the Nikon 600 f/4 VR. The most popular lenses are of course, the Canon 70-200 f/2.8L IS and Nikon 70-200 f/2.8 VR. Does your site share experiences with your customers about the reliability of lenses (i.e., failure rates of brands, models, etc…)? We don’t in any formal way, but we often have conversations with customers and are always very frank in any type of evaluation of gear. Do you include any user education materials with your rentals (i.e., how IS/VR works, how to use a tilt-shift/perspective control lens, how to use a macro, etc…)? 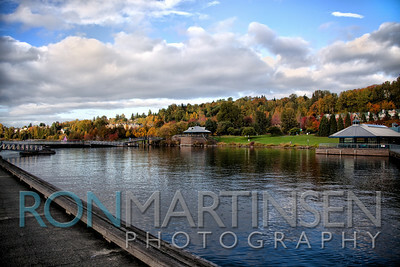 We do provide this kind of content on our blog and have been adding in content as we receive requests from customers. 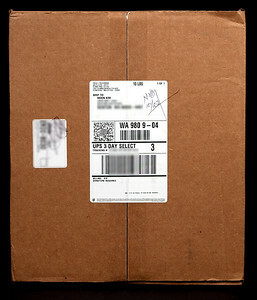 Yes, we provide a prepaid UPS return label in all of our packages. We provide third party umbrella insurance on all of our packages. The prices on all of our gear, except on super telephoto lenses, include round trip shipping. 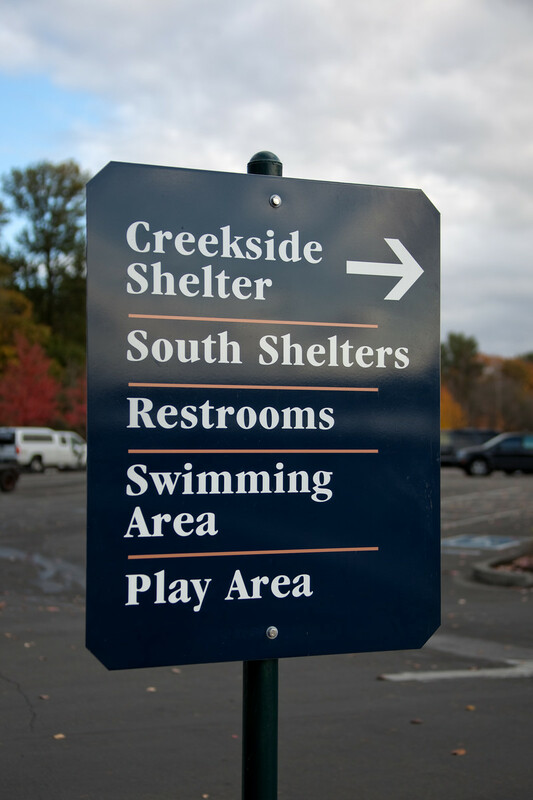 What is your policy for holidays and weather events? (i.e., week rental ends on a holiday weekend, Christmas, etc…) or a snowstorm closes the airport for the city so the lens can’t return on time? They get an extra day for free if the end of their rental period falls on a holiday or there’s a weather event. We tend not to penalize our customers for events and dates beyond their control. We treat our customers the way we would want to be treated as customers. How long to you rent gear before you retire it? We generally keep a piece of gear for about 20 rentals and then sell it. Our goal is to always have fresh gear at all times that both functions and looks near new. Does your policy differ for different products? This policy does differ a bit. We generally sell cameras faster than the average lens. We also tend to keep super teles for a bit longer period of time as we have found that they generally get treated with greater care by our customers. Do you sell your used gear? If so, when and how? We have an annual sale of used gear in early November, going on right now. We sell directly on our site and communicate the start of the sale to all of our customers via email and Twitter. If a customer wanted to buy the lens they were renting, would you let them? In terms of a customer wanting to buy a lens they are renting, most often that’s not possible. It is possible when a customer has a lens that is at our near the end of its cycle, then we can accommodate the customer. 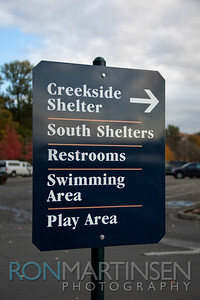 Anything else you would like to add that you feel sets you apart from other rental establishments? This is just a two platform (Canon and Nikon) site like all but LensRentals.com and CameraLensRentals.com, but it carries everything for those platforms plus a large selection of accessories (including a very cool underwater housing shown above). This site is definitely more than just lenses, despite the name, so you can usually find everything you need for a big location shoot. This is a great looking site when you first visit. The logo and banner image are first class and way more professional looking than anything in this series. 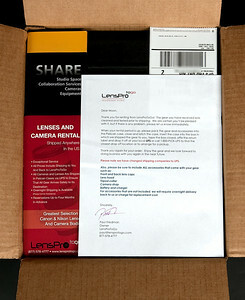 Perhaps this is why I always believed that LensProToGo.com was probably the biggest and best rental company on the web. 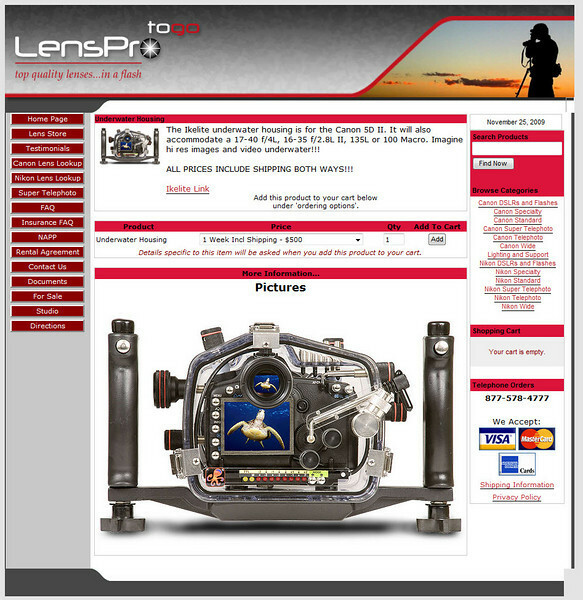 Perception is a powerful thing, so I think LensRentals.com, BorrowLenses.com, and ZipLens.com could benefit from hiring the designer that did this logo and header banner as this is first class design. Sadly, looks are deceiving and perception didn’t mean reality. When I tried to place my order for the 28-300mm, I was surprised to discover that it wasn’t possible to make a reservation for it. instead I was given an option to be notified when the lens became available (as shown in the screen shot on the top right below – I used my mystery shoppers email for the actual submission). 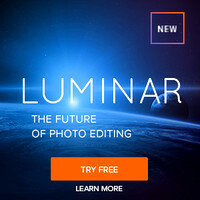 Unfortunately I was never notified, so after two attempts at using this form I finally gave up and sent a mail to customer service asking if I could reserve the lens. Unfortunately it took a couple of emails to actually accomplish that because Paul Friedman, the owner, was requesting that my mystery shopper (my wife) call in to reserve the lens. Since she didn’t know anything about what I needed, and since I couldn’t call, this presented a challenge that almost caused me to blow my cover. Paul finally gave in and took the order through email. After replying back all went well and the order arrived on time as promised. UPDATE: See the Here’s why I got an old lens section at the top of this article to understand that the hassle here was really about risk assessment to protect against fraud, which sadly does occur in ways very similar to this (i.e., customers refusing to call in). As a result the risk assessment was super high for my rental. 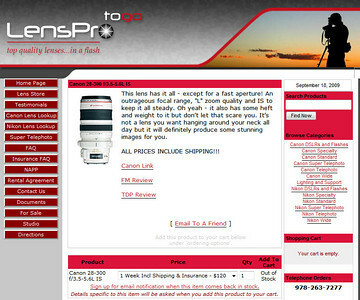 In talking with Paul after my rental was done, I found out that there is a glitch in the system at LensProToGo.com in that there has to be at least one lens in stock before you can see the order reservation screen (shown in the bottom left below). I thought this was a little odd as the time you most likely want to see it is when lenses are out of stock, but that’s the way it is. 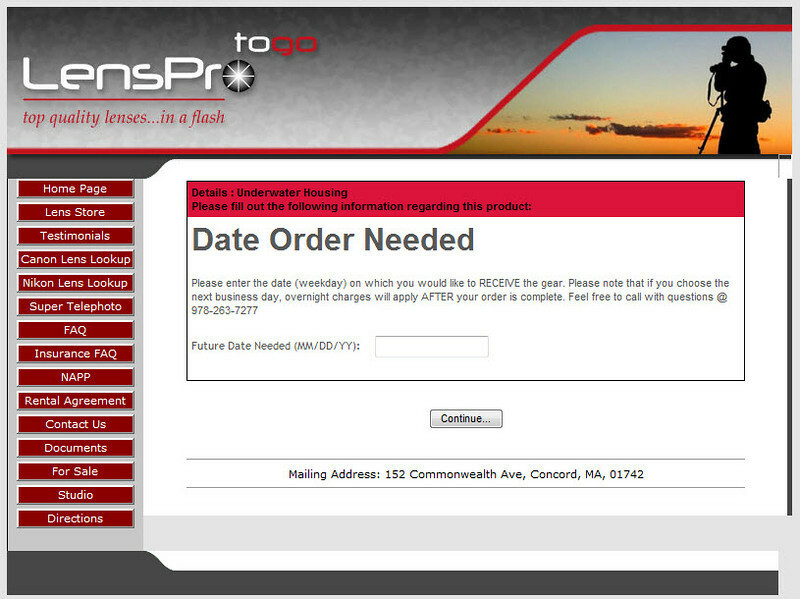 My biggest complaint about the web site here is that there’s no way to log in and see your current or past orders. You can’t get a receipt online, check the status of or cancel your order, get tracking information or anything. This is a HUGE shortcoming compared to the others in this series, and one that I found to be a major drawback. Upon request to Paul you can get a receipt mailed to you as shown in the bottom right below, but I think this site is behind the times and needs a customer login system desperately. You can create a customer record when placing your order and fortunately don’t have to re-enter that info if you visit again, but this isn’t a fully functional system like the others offer. We live in a fast paced digital world, so customers should be able to do everything they need online from the website without having to call in. I should be able to track my order, see my future reservations and order history, and I should be able to reserve online – especially when no lenses are in stock. In the end, this site was the most disappointing web site in the series because even though its performance was much better than the much slower ZipLens.com site, it didn’t have nearly as much functionality. As one of my development managers once told me, “I’ll take slow and feature rich over fast and broken any day of the week” – that pretty much sums up my thoughts here. UPDATE: I spoke with Paul about this and he agrees that the site features are a big weakness that need to be addressed. In fact, he’s in the process of building an all-new web site for release next February that will address these shortcomings. Hopefully this article is will help to ensure that the most important features are included, so this should be an upgrade worth checking out when it comes online. 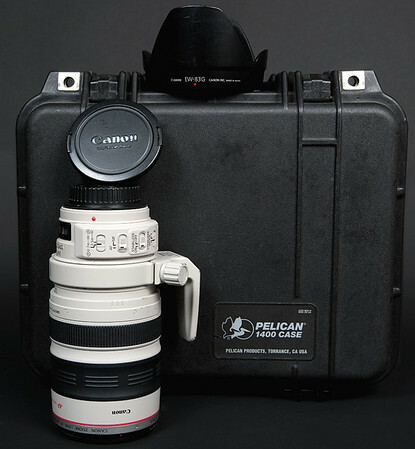 Pelican cases are legendary for the level of protection they offer, so I was pleased to see that LensProToGo.com chose to use a Pelican 1400 case to transport the lens. This made packing and unpacking a breeze. Returning the lens was awesome because you just put the lens in the case, drop it in the box, seal the box and attach the included pre-paid sticker. What could be more simple than that? The only thing I can find as an area for improvement here is the fact that the case was pretty beaten up which doesn’t make for a good first impression. I suspect that the lens and this case went into service together, so that’s probably why it looked so bad (this lens had the appearance of a lens that had been in service for a few years). It worked properly though and definitely protected the lens, so there’s not much to fault with it. However, if I were Paul I would probably rotate these boxes out a little more frequently if the lenses are going to stay in service for so long. Like others in this series (except BorrowLenses.com), the enclosed letter failed to include the return date which I found to be very frustrating for reasons described earlier in my web site comments. 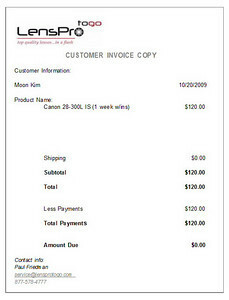 Note to ALL lens companies: Please add a return date in big, bold 32+ point font on your invoices and include that with your orders. Your customers will thank you for it! My initial contact (via my wife’s email) with Paul to reserve the lens put me off a little bit as I grew up in the day where you didn’t question the customer. If the customer says, I can’t call so can I just do it in email, you say – sure no problem – here’s what I need. That didn’t happen (see the website section for more info), so if I were a normal paying customer I would have just ended my transaction there and moved on to a different service. However, I needed to review this site so I pressed forward and Paul agreed to handle the transaction via email. UPDATE: See the Here’s why I got an old lens section at the top of this article to understand that the hassle here was really about risk assessment to protect against fraud, which sadly does occur in ways very similar to this (i.e., customers refusing to call in). As a result the risk assessment was super high for my rental, so I now believe Paul’s skepticism was totally justified. My lens arrived on time, but with less communications than any other site. I suspect since I didn’t go through the order system on the web site (and it was handled via email), I never received detailed order confirmations, tracking numbers, shipping notifications, etc… that I received from all the other sites. I did get a notification from Jenni on October 20, 2009 2:33:26 PM PDT that my order had shipped via UPS but it only mentioned the lens and didn’t include tracking information. Since signatures are required, I thought this was really odd. UPDATE: I discussed this issue with Paul and it is unclear where the system broke down here as the process didn’t change between my first and second orders. However, the second order had a reasonable level of communication. We are investigating the issue and I’ll report back once the issue is understood. In the end, the lens worked fine when I had it and the shipping and return went smoothly. It was a much different experience than all of the others in this series due to the fraud risk assessment, which primarily occurred because I chose a lens that was out of stock and the glitch in the web site that required a call in for that scenario. I ended up contacting Paul about it at the end of the rental and he was horrified that I had the misfortune of renting one of his oldest lenses which was due for retirement, but under the circumstances he was trying to minimize his losses should I have turned out to be a fraudulent user who ended up stealing the lens. We agreed that I’d give him another shot, but the element of surprise was gone so I’d have to run with this experience in the series. I can say that my subsequent rental went much better, the email communications were better and I had a brand new Canon 100mm f/2.8L IS USM macro lens in a brand new Pelican 1400 case. I’ve talked to others who have rented from LensProToGo.com (plus they have testimonials) and they confirm that they’ve never had the negative experience I had, so you shouldn’t expect the experience I encountered – especially if you take the time to just call in to prove that you are a honest renter. I will write a follow up article on my 100mm rental experience at the conclusion of this series which I encourage you to come back and read. There’s very little data on the web about the Canon EF 28-300mm f/3.5-5.6 IS USM lens, but from what little I’ve seen I thought it would be great to own one of these. After all, an “L” lens with an astonishing 28mm to 300mm range means you really only need to carry one lens when travelling. While it is a big lens, I will typically carry my 24-105mm f/4L IS USM in addition to my 70-200mm f/2.8L IS USM or my 100-400mm f/4.5-5.6L IS USM so it would actually be lighter and easier to only carry one lens. Isn’t this the dream of many photographers? The one great lens that does everything well? Of course, life is never that simple and we know that the physics of light suggests that trade-offs must be made to accomplish what this lens can do. The net result is that it is much better than most “one-size fits all” lenses I’ve seen, but definitely not as sharp as most L lenses in Canon’s line-up. Physically it looks and works exactly the same as my 100-400mm, so I suspect that Canon uses the same external shell and just uses different glass and labeling for these two push-pull style lenses. My 100-400mm is significantly sharper than this lens, but as you can see from the images below that with a little post-processing it is no slouch either. It’s also VERY cool for scenarios like the last two pictures where I was standing in the same spot and two the picture on the bottom left at 28mm and then the picture on the right at 300mm (it’s a close up of the building in the left side of the 28mm picture) – both hand-held without changing lenses. 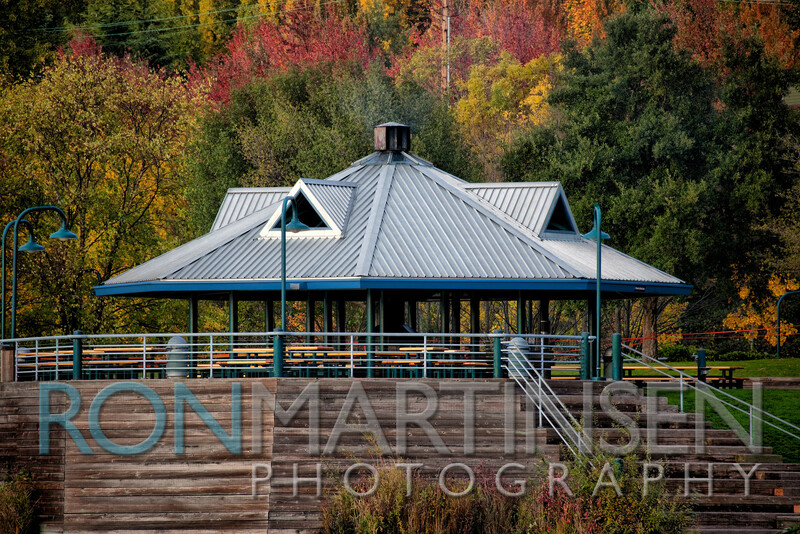 A decent landscape and super-telephoto lens in one – what a cool lens to have in the bag! Click the images below to see larger versions that have been post-processed only using Viveza 2.0 directly from Lightroom 2.5. This is a classic case where you need to walk in another man’s shoes to fully understand all the issues here. At first glance (and my first iteration of this review) I was pretty harsh because I got an old beat up copy of a lens and I had to argue with Paul to avoid calling in. However, I now understand that fraud is a problem in this industry and first time renters who refuse to call in are a high risk category for lens theft. Loss control resulted in me getting the oldest copy of a lens (reserved for scenarios like mine) rather than the nice new copies they have in stock, which is the more typical customer experience. He didn’t know why I couldn’t call in (mystery shopper scenario) and I didn’t know why he insisted I do (he’ll now let customers know it is for fraud risk assessment). We both learned something here, so I encourage you to understand the context and realize the value in calling in. With respect to calling in, I had some trouble with this as I kept getting voice mail telling me to leave a message. It turns out that the (soon to be corrected) voice mail message fails to point out that business hours are between 8:30 AM to 6:30 PM EASTERN, and with me being on the West Coast, I was calling outside those business hours. I didn’t know this, so I thought it was difficult to get through, but that shouldn’t be the normal case when you call during business hours unless all lines are busy. A new line is also due to be added to reduce the odds even further. Take note of the time and your time zone when calling in to avoid this being an issue for you as well. The important part, is that despite the risk assessment, I still got my lens on time and everything beyond some missing email (still under investigation) went well. Taking the time to call in during business hours would have made a huge difference in this rental experience. Learn from my mistake when dealing with any of the rental companies in this series as it is fair for them to be cautious when things don’t seem right (which in my case, Paul accurately sensed something was up – but fortunately he didn’t guess it was the mystery shopper). 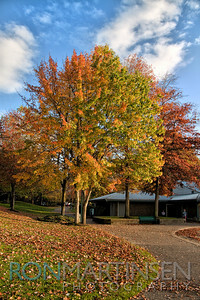 LensProToGo.com has an excellent ResellerRatings.com rating, and I trust the ratings there. Understanding the fraud risk issue now explains why my original experience was inconsistent with a majority of LensProToGo.com’s customers. I strongly advise you to give them a shot as my second rental experience was much better, and more consistent with the feedback from the testimonials and ResellerRatings.com. Stay tuned for my follow up article after the series where things went much better. Online order system where customers can log on and track their order history is a must. There is a login system when placing your order, but it only seems to be a tool to store your contact info so that you don’t have to re-enter it on future orders. It needs to be much more than that. It’s been my experience that ResellerRatings.com ratings pretty much on the money, so when you see a good rating from a company like LensProToGo.com you can feel pretty confident that you’ll be in good hands. This company has a large selection and the best overall prices (see the conclusion article), so when doing your own price comparisons don’t let their big rental price scare you. Other sites can end up being up to 40% more than the quoted price after your credit card gets charged, but with LensProToGo.com the quote price is the final price, and it’s a good value. Be sure to look for its new web site in February which will address most of my areas for improvement. I’d also recommend that you learn from my experience - a short call with LensProToGo.com will help reduce the risk assessment for first time renters, and ensure that everything goes smoothly. Please read the Lens Rental Series- Introduction (1 of 7) to learn more about other companies renting gear and providing discount coupon codes as well as my thoughts. Stay tuned to the conclusion as this series is more than just about the numbers you see in the conclusion here. 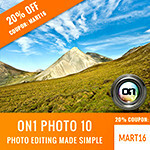 LensProToGo.com has been gracious enough to offer you a 5% discount off any order when you enter the coupon code MART5 as shown above in yellow.